Earth Sheltered, energy-efficient houses are bright, airy, dry, and quiet. Though popular now among advocates of passive solar and sustainable architecture, Earth Sheltering has been around for nearly as long as humans have been constructing their own homes. Earth House Estate Lättenstrasse, Dietikon, Switzerland, By Peter Vetsch. Earth sheltering is the architectural practice of using earth against building walls for external thermal mass, as an insulating blanket to reduce heat loss, and to easily maintain a steady indoor air temperature. Earth sheltered homes protect against temperature extremes, wind, rain and extreme weather events. An earth sheltered home is energy-efficient, quiet, freeze-proof and low maintenance. Earth sheltering is popular in modern times among advocates of passive solar and sustainable architecture, but has been around for nearly as long as humans have been constructing their own shelter. Robot Ranch, Ferris, Texas — This Earth Sheltered Monolithic Dome home, built into the side of a hill, has a floor area of 4,144 square feet, including two bedrooms and bathrooms, living area, kitchen, theater, office. Photo By Al Schwartz from Monolithic.com. Three types of earth sheltering are used in construction. The first type has two aspects, Earth-Covered, where dirt covers only the roof and Earth-Bermed, where dirt is pushed up against the exterior walls only, and not onto the roof. In-Hill Construction denotes building a house into a slope with only one wall facing out. The third, Subterranean, sets the house underground with only the roof exposed, allowing light and ventilation. The three sod-topped reconstructed longhouses that sit on the remains of a 1,000-year-old Norse colony at L’Anse aux Meadows exemplify the sustainable architecture that the Vikings knew about centuries before LEED. Located on the northernmost tip of Newfoundland in Canada, the grass-topped homes seem to disappear into the grassy landscape. Photo: D Gordon E Robertson in Inhabitat. “Another type of building is emerging: one that actually heals the scars of its own construction. It conserves rainwater and fuel and it provides a habitat for creatures other than the human one. Maybe it will catch on, maybe it won’t. We’ll see.” — Malcolm Wells, 2002. Aesthetically an earth sheltered home blends with the natural environment, leaving more yard space and more space for wildlife. Covering structures with vegetation reduces site erosion, sedimentation and stormwater runoff. Earth shelters also provide privacy from neighbors, as well as soundproofing and reduced light pollution. Energy use can be reduced up to 50 to 80 percent for underground and an earth-bermed house can reap about 95 percent of those advantages. Adding an earth roof, or living roof, further promotes planetary health by “greening” the house’s footprint. The Earth does not insulate well, but absorbs and stores heat, with its thermal mass. Fifteen feet below ground the soil maintains a fairly constant temperature equal to the annual average temperature of the area’s surface air. With adequate insulation, assuming an average of about 55 degrees would mean it keeps warm from chilling winds and freezing temperatures in winter and cool during the blazing afternoons of summer. Many earth homes incorporate passive solar designs lessening even further the need for fuel for heating or cooling. An earth-covered concrete roof rather than shingles cuts maintenance and costs. The reduction of air infiltration within an earth shelter can help maintain temperatures, as little structure surface is exposed to the outside air. This alleviates the problem of warm air escaping the house through gaps around windows and doors. Indoor air pollution can become a problem without constant fresh air circulation. Problems of water seepage, internal condensation, and bad acoustics can occur if an earth shelter has not been properly designed. Issues also include the sustainability of building materials. Earth sheltering often requires heavier construction than conventional building techniques, and many companies have limited or no experience with earth sheltering, potentially compromising the physical construction of even the best designs. The Hotel Sidi Driss, a traditional Berber troglodyte (cave dweller’s) building keeps cool in the desert village of Matmata, Tunisia. The hotel served as the home of Luke Skywalker on the planet Tatooine in the Star Wars movies. Photo: Andy Carvin. Historically, earth berming was a common building practice that combined heavy timber framing and rough stone work with stacking thick layers of sod or peat against the walls and on the roof. This served as excellent protection from the elements. In a relatively short period of time the earth layers grow together leaving the structure with an appearance of a hill with a door. Today’s bermed earth structures are built quite differently from those of the past. Common construction employs large amounts of steel reinforced concrete acting as structural support and building shell. Bulldozers or bobcats are used to pile earth around the building and on the roof instead of stacking earth in place. One historical example of in-hill earth shelters would be Mesa Verde, in the southwest United States. These building are constructed directly onto the ledges and caves on the face of the cliffs. The front wall is built up with local stone and earth to enclose the structure. Mesa Verde, in the southwest United States, is constructed directly onto the ledges and caves on the face of the cliffs. Photo By Massimo Catarinella. Similarly today, in-hill earth shelter construction utilizes the natural formation of a hillside for two to three of the exterior walls and sometimes the roof of a structure. Alternative builders craft a type of in-hill structure known as an Earthship. In Earthship construction, tires rammed with earth are used as structural materials for three of the walls and generally have a front façade of windows to capture passive solar energy. Underground village in the area of Khandovan, Iran, using volcanic cones of compressed ash as underground cave dwelling homes. Photo By Fabien Khan. The development of modern underground architecture has paralleled that of ecologically responsible design since the energy crisis of 1972. Underground buildings are practically tailor-made for achieving LEED certification. Yet, in the documentation of the LEED rating system, the word underground appears only twice – and only in the context of underground parking. Successful examples can be found in Australia where the ground is so hard that there is little to no need for structural supports and a pick ax and shovel are the tools of the builder/remodeler. See Coober Pedy and Lightning Ridge. The Forestiere Underground Gardens in Fresno, California is a North American example. Thanks for the post, it was a great inspiration. I haven´t been very familiar with earth sheltered homes so far, but I can see it has a real potential and it´s worth digging into this topic more. 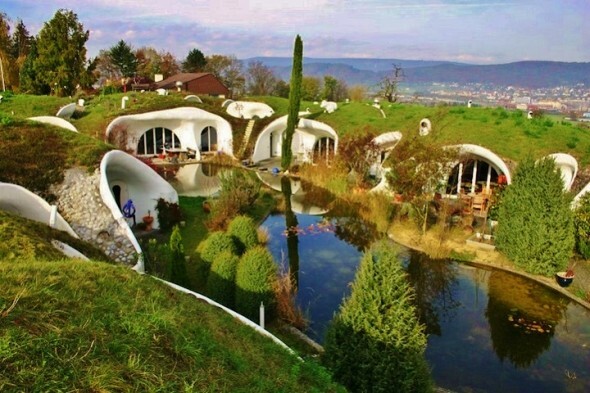 I believe people are becoming more and more environmental conscious every day and are searching for ways how to get closer to nature, be connected with it somehow and it seems like this type of housing is ideal for that. Regards, Adam. So many different options. I really want to have one built in a few year. Seeing more options helps me get a better vision. Thanks for sharing! !